Right from the start let me state that I consider J.R.R. 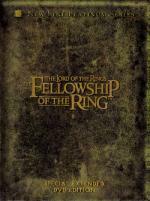 Tolkien’s The Lord of the Rings to be the greatest piece of literary fiction ever penned by an author. The intricacies and detail that went into the development of this grand saga are as wondrous as the story itself. Not only did Tolkien create a mystical landscape upon which to set his tale, but he also created full-scale languages for the different races of beings that inhabited his Middle Earth. Co-existing in a world akin to our middle ages, elves, dwarves, hobbits and men live peaceably side-by-side and in times of strife, unite to battle the destructive forces of the bastion of pure evil in their world, Lord Sauron. I was first indoctrinated into this magical world, by a friend in high school who let me borrow the pre-cursor to this epic, The Hobbit. In a span of about eight hours, I read the book from cover to cover and was hooked. Over the course of the next three weeks I launched into the trilogy, spending countless hours envisioning myself as a ranger in the realm of the One ring, even going so far as to read the book on top of a rock escarpment that overlooked a small village, just so I could set the proper mood. In the end, my saddest point of contention was actually finishing the book and realizing that I had become so engrossed in the narrative, that I now had nothing further to read and occupy my mind. About a year later, director Ralph Bakshi tried to bring half of the story to the big screen in an animated version. Special effects at this time were making great strides in development and Bakshi thought that using live action models over which certain animated characters could be painted upon in post-production, would lend a sense of realism to the action. Sadly it did not work and viewers were quite disappointed in the final product. At this time I found myself in agreement with Tolkien’s son Christopher, who stated that he felt that it would be impossible to bring about a realistic interpretation of his father’s masterwork to the silver screen. Then in the late nineties, New Line Cinema decided to take a bold chance by announcing that they were adapting the story into a trilogy of separate movies to be directed by New Zealand director, Peter Jackson, and filmed in one massive production and released in successive years. The gamble would pay off quite handsomely for both Jackson and New Line, as legions of fans from around the world flocked into movie theaters to witness the grand spectacle. J. R. R. Tolkien (1892)...Novel "The Fellowship Of The Ring"
In 1999, director Peter Jackson was relatively unknown to mainstream American film audiences, but was famous in his homeland of New Zealand for making stylish and creative horror films. Being adept with the criteria needed for making successful special effects laden films would help him to overcome many obstacles associated with a production of this magnitude. Not only would he be directing this epic, but he would also be one of three authors co-writing the screenplay. This ‘hands on’ approach to almost every facet of the production would bring about an intense and exhaustive amount of detail that not only enlivened but also hindered the rendition of this story. After a lengthy and laborious round of auditions, the cast and crew were relocated to New Zealand, where the primary exterior location shoots were to take place. The island nation would serve the production team well, as it seems the New Zealand landscape is home to an endless array of forest, jungle and mountain settings, thus creating some of the most breathtaking cinematography imaginable. At the onset, I can understand Jackson’s decision to omit certain characters such as Tom Bombadil from the film, but I do believe he was swayed by his writing partners Fran Walsh and Philippa Boyens, to build up the female characters (Arwen and Galadriel) to appeal to a more balanced audience base. Granted they are established screenwriters and know their trade, but over the course of the following two films this decision would cause more problems than it would resolve. In my life, I can honestly say that I have never met a single woman who enjoyed this book. They find it too masculine in its scope and therefore un-interesting and un-approachable. Now that I’ve gotten that little diatribe off my chest, here’s what I liked about the first film. As I mentioned earlier, the cinematography is spectacular, with almost every setting a realization of what my imagination had invented. All the characters look their part quite remarkably, which stems from the fact that Jackson employed the services of one of the world’s most renowned LOTR illustrators, Alan Lee. The opening scenes of Bilbo’s birthday party are set amongst lush green hillsides that showcase the Shire as the pastoral paradise that all hobbits perceive it to be. From the party to the council of Elrond in Rivendell, the action moves at breakneck pace, keeping the viewer attentive, but sacrificing one redeeming charm of the book; the camaraderie of the fellowship and the development of their characters as the story progresses. By the end of this first film I felt slightly shortchanged in narrative substance, but equally compensated for, in entertainment value. With the success of this first installment, any apprehension that had been felt about the magnitude of this project was erased, and eager anticipation for the subsequent releases substituted. 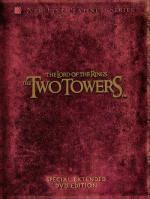 J. R. R. Tolkien (1892)...Novel "The Two Towers"
With the incredible success of The Fellowship of the Ring in 2001, would director Peter Jackson be able to duplicate the excitement and entertainment in his second outing, or succumb to the dreaded ‘sophomore slump’? The task ahead was daunting; in the ‘fellowship’ his group of characters had moved unilaterally to achieve their goal, but now they have splintered and have gone in separate directions. Simultaneous storylines in a film have always been a problem for directors, but Jackson was working with great material and benefited from the fact, that a high percentage of his audience had already read the book. This would give him the freedom to move back and forth between the concurrent plots and still keep hold of the viewer. I have spoken to many people who found the second film to be a little lethargic in its pace and not quite as exciting as The Fellowship of the Ring. Many of these same people also felt that this was the problem in the second book too. Yet I’ve always maintained that The Two Towers is the where the groundwork for all of the action and suspense to come, are built. Yes it is gloomy and methodical, but this is the strength of Tolkien’s words and the importance of his linguistic background. He uses words just as a painter uses varied brushstrokes to convey meaning and to create the proper atmosphere. One must remember that as Sauron becomes more powerful, the darker the plot becomes. When the end comes and the Ring is later destroyed, all of this dreary build up will be replaced in an awakening of life, liberation and achievement. The true star of this film never actually appears onscreen; Andy Sirkis, who plays Gollum, benefits from the advancements made in computer generated special effects over the last two decades. Taking Bakshi’s original idea of using live action models to create movement and overlaying the character’s image proved to be the right way to go, albeit 25 years later. What separates Sirkis’ performance from that of being nothing more than a moveable mannequin, is that he also captures the vocal essence of the beleaguered creature, creating a performance that should have been rewarded at Oscar time. Those who say that this film lacked the action of the first film must have been out buying popcorn during the battle of Helm’s Deep. I’m truly amazed at the scope of detail brought to this battle by the crew at WEA. At times it reminded me of the scenes of the Roman legions attacking the slave rebels in Spartacus, but even bolder in its capacity. As the film winds down, Jackson decides to take a leap forward in the book and bring us to Shelob’s lair. This brings the focus back on to Frodo and Sam, allowing viewers to catch their breath after witnessing the most amazing battle scene ever put on film. In the end, The Two Towers is an incredible transitional piece of filmmaking between the first and last films of this series. As that old saying goes, ‘the third times a charm’, and with the release of the final film in the LOTR trilogy, Peter Jackson was hoping to go out with a bang in the The Return of the King. The numbers didn’t lie; each of the first two films had grossed nearly $300 million in domestic ticket sales, and the last installment was assured of similar success. 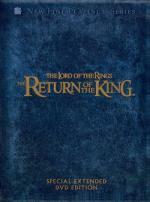 When it was all said and done, The Return of the King would tally up even higher ticket sales than its predecessors and be rewarded at Oscar time with eleven statues including Best Picture and Director. Although most fans consider this the best film of the three, I felt that this is where Jackson’s tinkering with the original story caused a major faux pas in quality. Now I don’t want to come across as some overly critical and curmudgeonly Tolkien purist, but in an interview that is featured on one of the special edition discs, Jackson states to the effect, that most people whom he had talked with didn’t find the chapter, ‘The Scouring of the Shire’, to be too relevant to the overall theme of the book. I don’t know whom he spoke with, but every person I’ve ever discussed the story with, found that particular chapter to be their favorite segment of the story. It is where Tolkien uses the theme of the enslavement of the Shire by Saruman as an allegory that in war, no one is left unscathed, and every person pays some kind of price. I honestly feel that this decision was made by his writing partners, Philippa Boyens and Fran Walsh, and when the ensuing uproar over the controversy became apparent, Jackson chivalrously tried to ‘fall on his sword’ with the abovementioned comment. I can understand that Jackson was treading in uncharted waters when he undertook this project, but when the first film brought in the staggering numbers that it did, he should have realized that the whole series was going to be successful and setup a series of re-shoots that could have added that essential chapter back to the film. Another small problem I had was with the recurrence of characters from the previous films whose presence was wholly unnecessary and probably best explained by contractual obligations that they appear in all three films. Frodo’s dream sequence involving Galadriel (Cate Blanchett) and Denethor’s flashbacks of Boromir (Sean Bean) are the prime examples of extraneous bits of film that serve no purpose other than to plant another sequence involving those actors. I won’t even get into the outrageous amount of screen time given to Arwen (Liv Tyler), whose scenes with Aragorn (Viggo Mortensen) seem to languish interminably and bring the pace of the film almost to a screeching halt. I don’t want these criticisms to be taken as overall contempt for this film. Peter Jackson has woven an excellent rendering, though being slightly diversionary in its approach, to one of the greatest works of modern day literature. It fills me with hope that its success will lead to a more comprehensive interpretation in the future, and one that stays truer to the essence of the story. Another reviewer on another website stated that the only true way to watch these three films is to view them in one sitting. His thoughts were such that you needed to watch them consecutively in an eleven-hour plus marathon to get the overall essence of the book. The first time I watched the trilogy was in their theatrical releases, the second time was in the manner that he spoke of, in one long viewing. I have to disagree with him in his assessment; I didn’t find it to be as enjoyable as when I watched them separately in the theater. It left me reminded of the criticism leveled at the film Gettysburg in 1993. One critic derided the film for being an endless build up comprised of troops marching here and there in anticipation of the impending battle. After the first film, this is almost what the final two films become; a lot of marching and battle build up by the Rohan and Gondor armies that precede their successive battles. Whereas the book meanders along in its establishment of the characters plights and sets an atmosphere that finally pays off when the battles are over. I feel that Jackson sacrificed essential character development for the sake of the action scenes. Yes it’s true that this book is classified as an adventure fantasy, but by using all this film space at the cost of character development, it leads to an appealing, yet unsatisfying venture for a true Tolkien fan. If you have never read the book, the character and plot omissions that I’ve mentioned will be meaningless, and you will be rewarded with an adventure that will overwhelmingly satisfy you if you are curious as to what this story is all about.